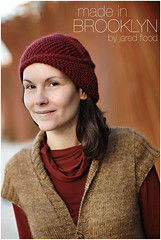 this pattern never stood out to me when first perusing the pages of handknit holidays. but when i saw some of these cropping up around on the internet, i started getting the itch. when i saw they were knit up in rowan cork, a yarn i had always wanted to try (but never wanted to drop the cash for a sweaters-worth on) for a long time, i was further intrigued. when i found out cork was discontinued, i was discouraged and the pattern drifted out of consciousness. then... in a random ebay search i found 3 balls of cork for a smokin deal (although the color is one that i normally wouldn't choose) and the log cabin socks were back on the table. and now, here they are, all ready for the fireplace in the log cabin that i wish i lived in. right now i'm settling for a hardwood floor and brooklyn. not a horrible sacrifice by any means... but i do like cabins. and the woods. i miss the pacific NW. but i'm not gonna whine about homesickness here. Modifications: had to lenthen foot to fit my big feet. Other than that, nothin! Thoughts: First, concerning Cork - in general i really loved it, and now really covet a full size sweater knit up in this yarn. Although, if I ever make a cork-sweater, i'll definitely be adhering to the advised needle sizes (9-11). the LCS pattern calls for a US6 for a denser fabric. The small needles combined with all the cabling really destroyed my wrists. Also, my US 6 DPN's are really sharp (i think they're crystal palace bamboo, but i'm not sure) and they constantly tried to impale my hands! what i'm trying to say is, this project was fraught with physical pain! which is not that fun. I guess i could've done some addi magic looping to take care of the porcupine effect, but i'm too lazy or stubborn. i wanted to use dpns! But the thought of a sweater with cork on US 9 addi's seems like a dream to me. So maybe someday, if i ever find some cheap cork. Oh, one more thing: cork seems to stretch and not keep its shape very well, at least in the ribbing at the cuff. I'm definitely planning on imbedding some elastic threads in the cuff to keep them wearable. for my socks, the snugger the better (is snugger a word?). *Note: couldn't get ideal light for the photos. its been dark and overcast. apologies. with that said, i started the sweater last night and am already more than happy with the yarn choice. i will be making some guage-specific modifications out of necessity. did i get guage? no. did i even get close? not really. but when has guage ever stopped anyone...right? more to come on this sweater and tubular-cast-on-inspired giddiness. have a great weekend, but don't forget your needles! great socks. they look very soft. what do you use for the elastic thread? I encounter the same slouch in some of my socks. as for the oath- you got to go with what project/yarn is calling you! so go for it! i love cork. i knitted a sweater out of it and it was great. too bad it's discontinued. oh!! i love the socks! I am wondering if the heels with the pattern would make it uncomfortable. About elasticity, you can do something like Diana (Streets and YOs) did - add some elastic thread to the socks ... that would help I think. i lucked into a sweater's worth of cork recently - very excited about it. i'm actually thinking about making the urban aran, possibly cardiganized, but i've only got 1200 yards of cork, which is EXACTLY what the pattern calls for in my size ... which concerns me. love your socks, though. they look reaaaaaaally comfy. that's a really great "manly" pattern for socks! 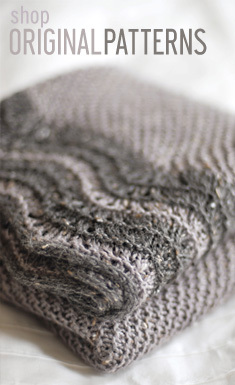 i've been knitting my husband a pair of grey blobs for the past month or so. 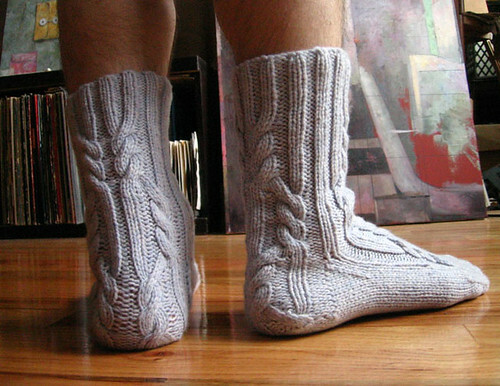 the plain grey ribbing is just not inspiring.. and of course, the socks HAVE to be big because he's got big manly feet. booorrring. i'll have to remember the log cabin socks for the future! the socks look great and now I can't wait to knit up some cork-goodness. rowanspun yum! I should really get working on my rowanspun jacket again aye! Your socks look great and you take such gorgeous photos too (I don't think they turned out too dark)! What camera do you use? They look great (as your pictures do!) I have wanted to try the Cork - may have to find some at a discount somewhere! Those look great! And do I spy vinyl on your bookshelf? And you know what, you won't be able to wear that scarf for at LEAST 4 months so let it marinate in the WIP pile. Where in the Pacific NW are you from? Will be spending two days up there this summer (not enough if you ask me, but that's all I can spare). You gotta love a man who knits his own socks! Question: Is the cable coming up the back of the heel uncomfortable to step on, or are you really not stepping on it, and it just looks that way? Great looking socks! Love those cables. It would be a shame to wear shoes over these! NO shame my friend, no shame! Only a scarf on the needles...you NEED to start something else...what kind of a knitter would you be?! Love the socks. I have about 2.5 balls of brown cork ready for work...just need the time now. Excellant job on those. The cables came out nice and clear, too. Does the pattern call for cable needles or just fancy needle work? That book is on my Amazon list from our talk before about it, now it's on the MUST list. If "snugger" is not a word, than you are a "jargoneer", according to my Forgotten English word-a-day calendar. A person who delights in the coining of new words in some field. Great Log Cabin Socks. I think I may have to make a pair! And I love that color for Jarrett. Can't wait to see some progress shots! I think a real knitter needs variation. After all knitting is supposed to make you happy. I always feel that I need to have both easy and difficult projects in my WIP-basket at any time. So, don't feel bad about breakibng your oath. I am glad you came to your senses. Your socks look great and I totally understand why you couldn't resist starting Jarret. Pacific Northwest? I live in Oregon! I knew there was something about you...! Love the socks, I just remembered about my Cork now. I just may have to cast-on for those socks, too. Love the new sweater yarn, it's so tweedy!! The socks looks wonderful, well worth the pain. I have been lurking for a while...you are the only male knit blogger I have found with good grammer, fantastic pictures, and interesting content. Any other recommendations? My husband is curious about my knitting and your blog is the only example I can find of a quality male knitter. Those socks are amazing! I have got to learn how to make socks. Your socks are like the pinnacle of all socks! 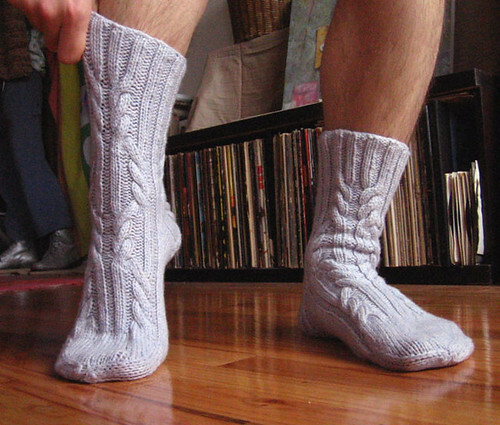 Those are the kind of socks I want to curl up in on a rainy weekend with a cup of tea! They're fantastic Jared! You've really made some wonderful things recently. I can't wait to see more of Jarrett . . .
You just made me look for my Cork. Although I've heard that when used with the appropriate size needles, Cork tends to produce uneven stitches. Gorgeous socks. I love that pattern, but haven't found any Cork for them. And I think you've lived up to the spirit of your oath, and really that's all that matters. 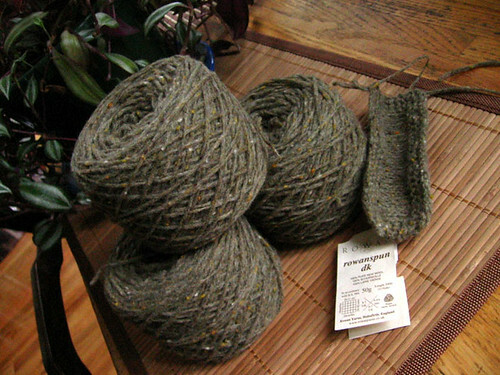 Love the tweed and I can't wait to see the sweater in progress. Nice log cabins - I agree they were murder on the hands though...the stitch definition with the cork is fantastic though. The Rowanspun you chose for Jared is a gorgeous color by the way - good choice! I agree that Cork doesn't keep its shape very well. That's one reason why I'm using 9s for a sweater with it now, rather than the 11s I've used for 2 other sweaters. But even with 9s, it's a much less pleasant experience than with 11s. First-time visitor, and I love your blog. Your photos are gorgeous, even if the light was crappy. I can't get enough of the Urban Aran cardigan below. I am NOT sending a link of it to the Man, because I don't want to be committed to the project (or committed in the straightjacket sense). I'll be back! With 27 projects on the official list right now (and that's down from 67 a few months ago), I can only wonder why you would want to restrict yourself to just one! About the Silky Tweed, I can't give you an exact measurement of how much it grew, but it did so both vertically and horizontally...although as you can see, the vest still fits me...it's just not as form-fitting as I wanted it to. Before I washed the pieces, they would act very springy and I was sure I was going to get what I wanted: a vest that would hug my torso...that's why I used a smaller needle than the pattern called for. However, once washed, the springyness (?) was gone and the fabric became drapey...the ribbing lost its pulling power and the vest was no longer stretchy... now it just falls down around my waist. It still fits me, so it's not like it grew a mile, but maybe an inch, inch and a half? However, there was some blocking involved, a very idiotic move on my part. Can I just pleeese jussst say that if am mudlmmbububmumbling in thisss postt it iss becaushe my jaw is still on the fluur. What a bloody fan-friggin'-tastic pair of socks! I want a pair like that - come over to my place and show me. I'll have fresh cake! Yeah, I'm having problems finishing Forbes Forest myself. It just seems to take forever. I'm like on my 3 complete repeat, you know where the pattern all matches up. anyways, love those cork socks. Will have to try it out someday. 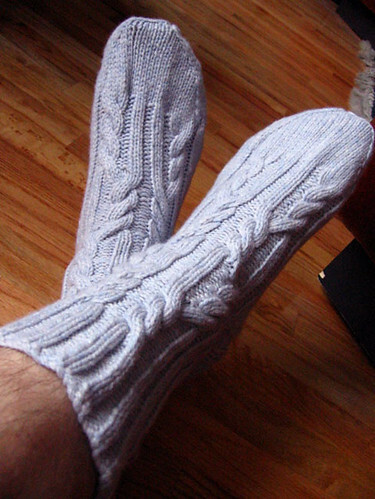 I'm knitting these socks right now out of RYCs CashSoft DK. They've been super fun to knit! Yours looks great! Love your blog, too! Great-looking socks. They look very warm and durable.